In 1969, Noel Harrison hosted an hour-long special on America's NBC network called Spring Thing. The co-host was singer-songwriter Bobbie Gentry and guests included Shirley Bassey and Goldie Hawn. The programme was sponsored by textile company Celanese, who made a wrinkle-resistant fabric called Arnel. As promotion for the show, and their product, Celanese released an album of music lifted directly from the programme. The highlights of this very rare record are Noel's song Gonna Drive All Your Bad Times Away and the duet Peaceful, which is sung with Bobbie Gentry. Speaking about the television show in 1969, Noel said: "Everyone in Spring Thing is young, talented, energetic and is blossoming career-wise. My co-host, Bobbie Gentry, has a lovely voice and a great mind and plays guitar beautifully." Unusually, the show was also shown by the BBC in Britain in April, 1970. As no film footage of the show is believed to survive, this promotional record is all that remains. NB: The B-side of the record contains six awful jingles which were used during the programme's ad breaks. Included with the record was a double-sided poster with one side featuring a picture painted by award winning psychedelic artist Jacqui Morgan while the other featured an advert for the television programme. A contemporary newspaper listing for the programme. 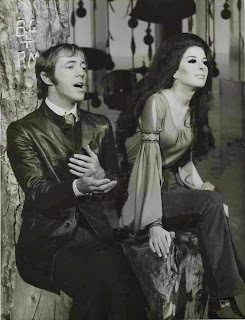 As part of the publicity for Spring Thing, a number black and white photographs of Noel with Bobbie Gentry were circulated to newspapers.